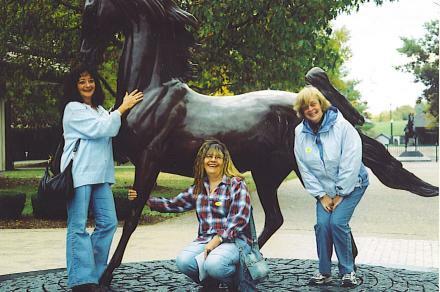 Beverly (center), Billie (left), and I (right), visited Kentucky Horse Park on a sunny and bright day. Man O' War loomed large in all his majesty; the sunlight streamed directly on his face. We stood in awe looking at his memorial which stands tall and sports a 28 foot stride. He was the thoroughbred of thoroughbreds. This picture gives a feeling of our relative size to the statue. We will remember this day as friendship and our love of horses shared. The horse connection often makes for life-long friends. The Park is a special place to share. Not far from Man O' War's statue is the burial site of Isaac Burns Murphy, the famous African-American jockey, who holds the record for the highest percentage of winning horse racing rides. "Located in Lexington, Kentucky, the heart of the Bluegrass, the Kentucky Horse Park is a working horse farm with 1,200 acres surrounded by 30 miles of white plank fencing. The park is like none other in the world. Dedicated to man's relationship with the horse, the park features two outstanding museums, twin theaters and nearly 50 different breeds of horses. All of these elements combine to make a visit to the park an enjoyable learning experience for everyone - from those unfamiliar with the horse to the horse expert. By 1850, the farm had been sold to Eliphalet Muir. Eliphalet was married to Anne Boone, a niece of Daniel Boone. Together, they further developed the farm, and specialized in raising Saddlebreds. After Muir's death, the farm was sold to S. J. Salyers in order to divide the inheritance between the Muir's many children. Salyers began to once again breed Thoroughbreds on the property. He was also responsible for building the residence now used for offices at the Kentucky Horse Park. The house, which was completed in 1866, was built on the foundation of an even older home which was burned prior to the Civil War (probably the Richardson mansion). But by 1890, the farm had once again been sold, this time to John D. Creighton. Creighton renamed the land Ashland-Wilkes Farm, and began to raise and train trotting horses. He built a training track in 1897 that is still used today at the Kentucky Horse Park. Unfortunately, Creighton was forced to sell his farm shortly after that in order to pay his many creditors. For a short time after Creighton was forced to sell, the farm was owned by two Lexington bankers. They leased the land to Colonel Milton Young, owner of McGrathiana Farm (now Spindletop and Coldstream Farms). Young sent several of his Standardbred yearlings raised on the property to a New York auction, where an agent for Captain Sam S. Brown saw them. Captain Brown liked their looks so much that he purchased their home in order to raise horses of a similar caliber."